Assorted Notions: What do you call a wadder in the baking world? What do you call a wadder in the baking world? 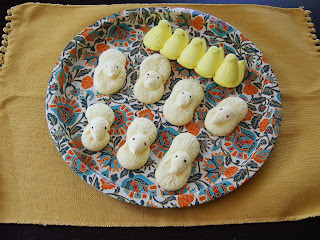 I found this idea for saffron meringue chicks (think Peeps!) via Not Martha earlier this week, and I decided this would be my Easter craft for the year. Meringues are pretty straightforward to make, just beat egg whites and sugar together, and in this case you just add some saffron to achieve the bright yellow color. I even cracked the eggs a couple of days ago as I read that older egg whites work better than fresh ones. So this morning, as I was getting these little babies ready, the KitchenAid mixer whirring away, I panicked when I realized that I had forgotton to add the saffron to the egg whites before beating(! ), when the liquid would help the saffron threads to dissolve. So I crumbled the saffron as best as I could and added it as the (very fluffy at this point) egg whites continued to beat. 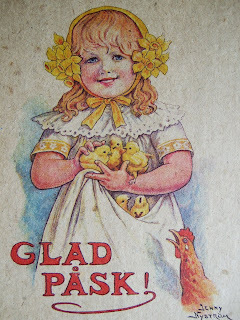 The mix turned yellow but the color just did not intensify as I would have liked and the chicks have little saffron 'freckles' in them. As you can see, I can use a little practice in shaping these things too. Oh well, next year! At least they are still edible, which I guess makes them more like a wearable muslin than a wadder, right? I like your comparison. I've made quite a few "wearable muslins"!